7 Kids and Us: Honey Bunches of Oats On-The-Go Single Serve Cups! 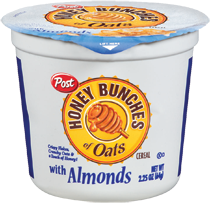 Honey Bunches of Oats On-The-Go Single Serve Cups! Mornings in the summer for us are more on-the-go than during the school year! We are always getting up and going to the park, or the beach or for a nature walk. Usually, we grab a cereal bar and head out..but now I love that I can pour some milk into a mason jar, and toss some of these great Honey Bunches of Oats Single Serve packages into my backpack and we are on our way! One cup provides 5g of protein and contains essential vitamins & minerals, to ensure you're getting a nutritious meal the whole family will love. You can purchase the single serve packages online here for about $15.00 for a pack of 12.